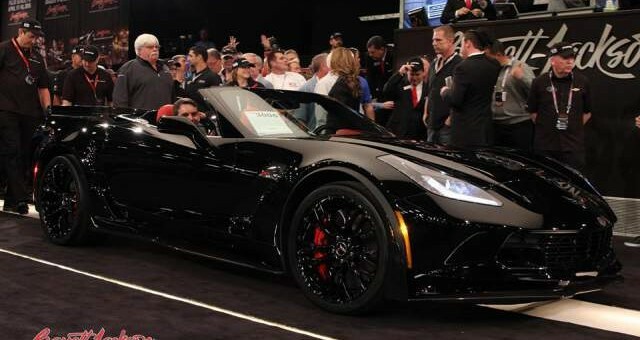 The Barrett-Jackson auctions in Scottsdale, Arizona just came to a close, where the first production Chevrolet Corvette Z06 convertible fetched a cool $800,000. That’s not quite up to the $1 million brought in by the first production Z06 coupe, but pretty close. The car came with a Letter of Authenticity, and the same supercharged 6.2 liter LT4 beast that lurks under the bonnet on the coupe. All of the proceeds from the auction went to United Way, a non-profit organization which strives to promote good health, income, and education in communities across the country. Perhaps the biggest technical bullet-point of the Corvette Z06 convertible – apart from the available 8-speed automatic which shifts faster than a Porsche PDK – is that the weight is not significantly increased over that of the coupe. Often, because the soft roof of the convertible removes some structural rigidity, weight increases as a result of extra bracing down below. Yet, the Corvette Z06 convertible weighs only 60 pounds or so more than the coupe, reportedly without introducing much additional flex. This Chevrolet Corvette Z06 convertible faired much better than the first 2015 model year Corvette Stingray which – being the second year of production – fetched a mere $400,000.